My friend and former diving buddy Jeremy Stafford-Deitsch who now lives pleasantly in Cornwall, recently published a new book*. It’s a biography on the life and work of Dr. Samuel Gruber, also known as ‘Doc’ or ‘Sonny’, the man who founded the Shark Lab on Bimini, Bahamas. The book contains numerous interesting pictures of Gruber himself, his field work with small and bigger sharks, the birth of baby lemon sharks and so on. And it presents a detailed description of the tagging techniques developed and practiced at the Shark Lab to track behavior of sharks. Varying from PIT (Passive Integrated Transponder) tags, acoustic or ultrasonic telemetry, satellite tags, position and temperature tags and so on. Some sharks are caught using long lines and ‘gillnets’, in particular to catch young lemon sharks near the mangroves. The biography also focuses on more personal matters such as Grubers battle with cancer in the 1980s, his successes and near-fiasco’s. An interesting part is the transformation of Gruber from ‘enfant terrible’ to grand old man of Marine Biology. The young Gruber was an athletic sun tanned dare-devil, often posing with a broad smile with dead sharks, even with a great hammerhead he had caught himself. Sonny liked to hang out with beautiful girls, what he probably was expected to do given his handsome appearance. And he did tooth paste advertisements claiming ‘dropping cavities’: a smiling Gruber showing a row of white teeth with his head on a dead bull shark also exposing its sharp row of teeth (pg 45 of the book). We now consider that tasteless and horrible. But these were other times with a different attitude towards sharks. Then the older Gruber gradually transformed into a different person. He started studying instead of hunting sharks, to grow a beard and then set up the famous Bimini Shark Lab. Especially the juvenile lemon sharks that often seek shelter in the mangroves on North Island received their attention. The book also contains the recollections of students and staff members who worked at the Bimini Lab. They reveal a mix of admiration for the inspiring pioneer but also glimpses of his difficult character and temper spells. As a retired behavioral neuroscientist I became interested in the question to what extent sharks can ‘think’, recognize, remember and ’feel’ like the allegedly smarter marine mammals. It is still a white spot on the map of behavioral marine biology. Although sharks seem to have a more 'primitive' brain than dolphins, they could have developed specific smart adaptions and perceptual abilities. 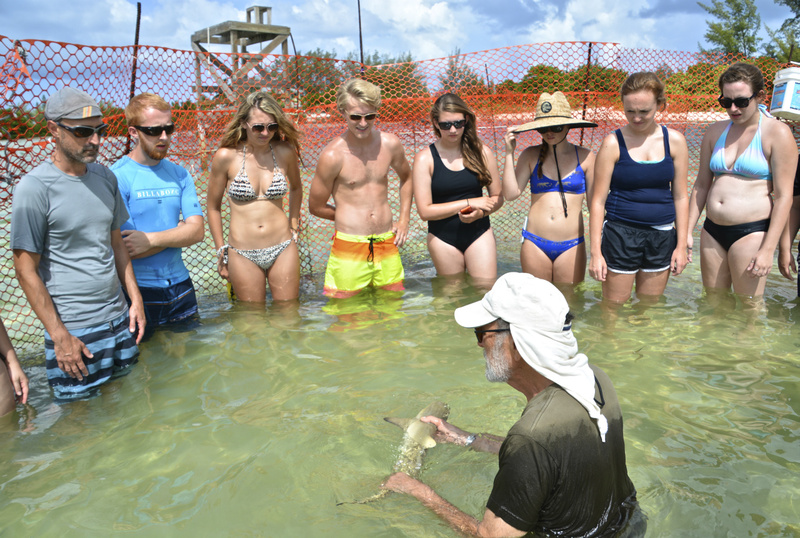 I also felt that it might be interesting for the Shark Lab to expand its research strategy. So, some years ago I suggested to Doc Gruber to start a ‘Cognition in Sharks’ project at Bimini. Meant to investigate the shark's perceptual learning and memory abilities in a controlled experimental setting, somewhat in the tradition of the great Sylvia Earle. But it appeared that the Gruber's team preferred to stick to their traditional mission: investigating the sharks behavior in a naturalistic setting, using shark tagging as their main tool. Finally, in our days of commercial interests leading to massive slaughtering of sharks, shark investigators and underwater photographers are confronted with a much more important mission. Namely the protection of sharks and the establishment of safe and guarded marine environments.